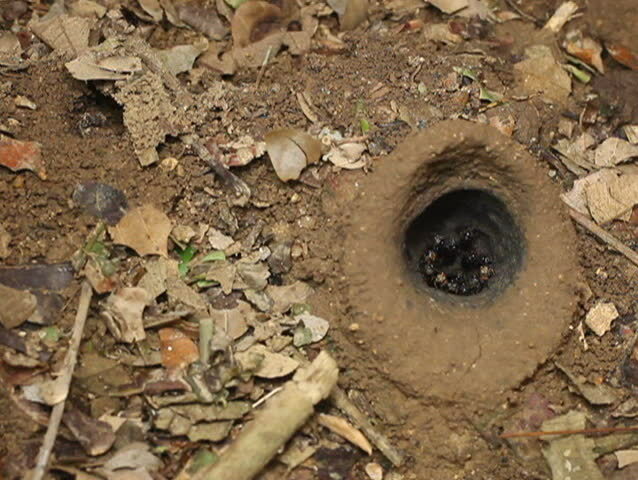 hd00:15Entrance to a meliponine bee nest. Bees swarming out of hole to defend nest. This species makes its nest on the raised soil of leaf cutter ant nests. In tropical rainforest, Ecuador. hd00:09Entrance to a meliponine bee nest. Bees swarming out of hole to defend nest. This species makes its nest on the raised soil of leaf cutter ant nests. In tropical rainforest, Ecuador. hd00:14Millipede (Diplopoda) at large. Creeping on the ground. hd00:19Western Kazakhstan. Ustyurt Plateau. A colony of ants. hd00:21Field crab crawls out of a hole and back into the hole.